Wire-free charging for our grab-and-go world. Thanks to cutting-edge Qi inductive technology, charging your enabled device is as simple as setting it on the pad. Anti-slip rubber coating keeps your phone in place. Temperature Control ensures your device never overheats. Idle mode never overcharges your battery or wastes energy. Minimalist and buttonless, this charger fits perfectly on a desk or nightstand. Lets you know when it’s ready to charge, charging, and when your device is fully charged. • Use a 2 amp AC adapter. 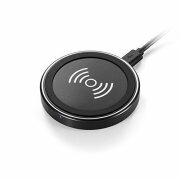 • Confirm that your device is Qi-compliant before purchase or use your own Qi-compliant cover to enable charging. • Protective cases that exceed 5mm/0.2in in thickness may need to be removed before charging.